Unlike Booker T. Washington who was born into slavery, William Edward Burghardt Du Bois was born into the tolerant northern community of Great Barrington, Massachusetts in 1868 and he experienced few incidences of racism as a child. He attended Harvard and was the first Africa-American to earn a doctorate there. He believed that the fate of all Africans worldwide are intertwined (Pan-Africanism) and co-founded the NAACP (Nat'l Association of the Advancement of Colored People). 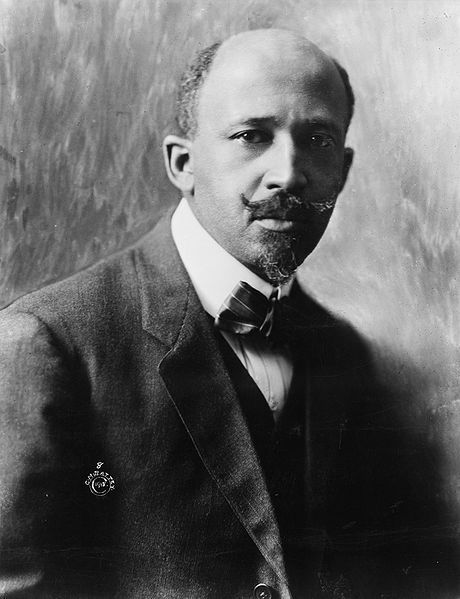 Du Bois vehemently opposed the philosophies of compromise for Southern blacks espoused by Booker T. Washington, instead advocating for full civil rights and increased political representation by a well-educated African-American intellectual elite. Considered the corner stone of African American literature, Du Bois' book The Souls of Black Folk (1903) provided a vivid portrait of what it meant to be black in America at the turn of the 20th century. He wrote three autobiographies in which he shared life experiences and political beliefs. He felt capitalism was at the root of racism, he was an ardent peace activist, supported nuclear disarmament and socialism. Du Bois had great influence galvanizing public opinion in his position as editor of the NAACP's journal The Crisis. Du Bois' death in 1963 afforded him a chance to preview, but not fully witness his works' effects on human rights advocacy worldwide.